Don't throw out those cardboard tubes that hold toilet paper. There are lots of great ways to recycle toilet paper rolls, including some amazing and fun craft projects. These ideas are easy enough to do with kids, and they're a great way to use something that might otherwise end up in a landfill. You can make a sweet forest gnome out of a toilet paper tube. You'll just need a few household craft supplies and a little time. Paint the bottom two-thirds of the toilet paper tube blue or whatever color you'd like the gnome's outfit to be. Paint the front of the top of the tube flesh-colored for the gnome's face. Paint the back of the top of the tube white for the gnome's hair. While the paint is drying, cut a semi-circle out of the red cardstock for the gnome's hat. Use a small plate to help guide your cutting. The diameter of the circle can be anything you want, depending on the size of the hat you have in mind. Roll the semi-circle into a cone and secure with tape. Use clear tape to attach the hat to the top of the tube. Use markers to draw the gnome's face and arms. 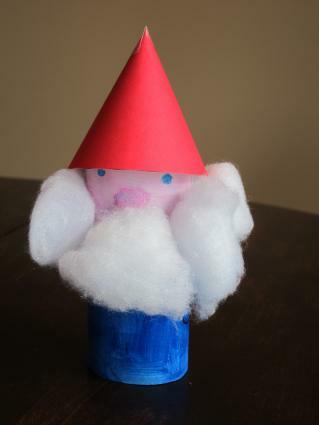 With glue, attach several cotton balls for the gnome's beard. Allow the glue to dry. Turn cardboard drab into floral fab with this fun craft. You can make a single bloom or create a whole wreath of flowers. You probably even have the supplies you need on hand. Pinch the toilet paper tube to flatten it a little and create a crease on each side. With scissors, cut the tube into to six slices, each about the same size. These don't have to be perfect, so there's no need to measure. Take two of the slices and insert one end of the stapler into each slice. Adjust the slices so the creased portions line up and are right next to where you'll place the staple. Close the stapler to staple them together. Repeat with each slice, adding to the flower one petal at a time. When you reach the last petal, staple it to the first one. Place the flower on a newspaper or piece of paper. Paint it with your desired color of tempura paint. Allow to dry thoroughly. 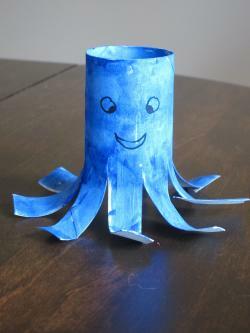 This craft is perfect for working with kids, especially if your child is interested in undersea animals. It's a fun and easy way to use up your cast-off toilet paper tubes and create a special sea friend together. Start by cutting the lower half of the toilet paper tube into eight equal strips to create the legs of the octopus. It's easiest to do this by making a series of even cuts on opposite sides of the tube. Use your fingers to roll the strips back on themselves, allowing the octopus to stand upright on his legs. Paint the entire octopus inside and out as desired. You can use one color or multiple colors to achieve the look you want. Allow the octopus to dry completely. Use markers to apply the octopus face. Turn a humble toilet paper roll into head wear fit for royalty with this fun idea. 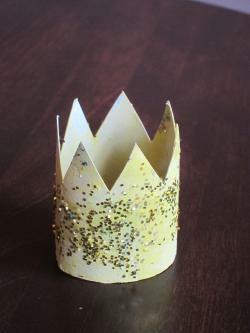 You can create two miniature crowns out of each tube and a few other common craft supplies. Cut the tube in half, trying to crease it as little as possible as you work. Set one half aside to make a second crown later if you want to. With scissors, create a pointy top for the crown by cutting shallow triangles out of the toilet paper roll. Paint the crown inside and out with tempura paint. Use any color you like. Before the paint dries, sprinkle the crown with metallic glitter. Allow the crown to dry completely before wearing or playing with it. When they're covered with fabric and displayed on your table, no one will ever guess that your napkin rings were once a toilet paper tube. This craft is easy to make, and it looks surprisingly elegant. Creasing the tube as little as possible, cut it into four equal slices. For each napkin ring, cut a rectangle of fabric that is slightly wider than the width of the tube and long enough to stretch all the way around it with a little overlap. 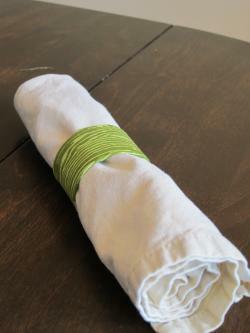 Place the fabric rectangle right side down on a work surface in a well-ventilated area. Spray it evenly with spray adhesive. Working quickly, wrap the fabric around the slice of the toilet paper roll. Tuck the raw edges inside the tube. Repeat with the other three slices and allow all of them to dry thoroughly before using. 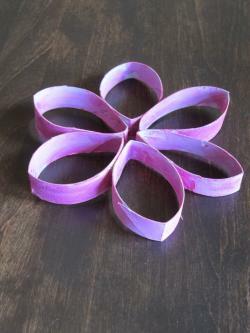 Making toilet paper roll crafts is a great way to reuse cardboard that you might otherwise throw away. With these fun ideas, you can transform trash into adorable creations that will delight both kids and adults.